For true coffee aficionados there is far more to creating the perfect cup of delectable brew then simply scooping ground beans from a can. In fact the ritual of properly preparing said cup is not only an enjoyable process, it is extremely important to the overall outcome of the finished product. That being said, the first step to brewing a great cup of coffee should always start out with grinding fresh beans of your favorite java. Coffee beans are at there best when ground only moments before they come into contact with hot water. That way the intense and robust flavors are locked in instead of being lost. An electric coffee grinder is the perfect solution. There are a plethora of brands and models available on the market today, however we will carefully examine and review one in particular. It is called the Bodum Bistro Electric Burr Coffee Grinder. 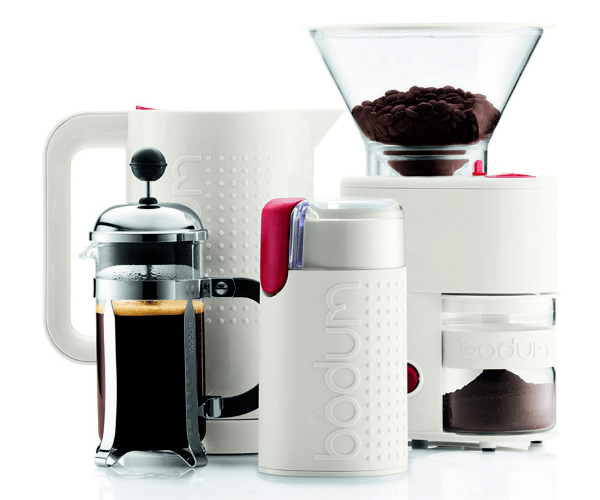 First we’ll go over the highlighted features and tell you how the Bodum Bistro Electric Burr Grinder works. 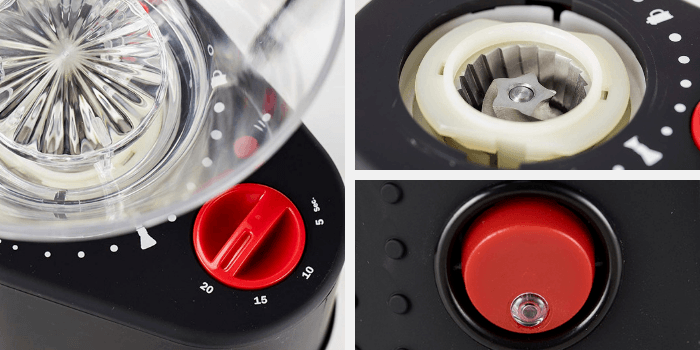 Next, we’ll give you a few tips for using, cleaning and maintaining the Bodum Bistro grinder. Then, we’ll dive into the what we like and the one thing we didn't like about this nifty little grinder. Sound good? Grab your coffee and let`s dive in. The Bodum Bistro Electric Burr Coffee Grinder incorporates some incredible features, especially for a unit that is priced in the entry-level position. It is easy to use, especially for people that are new to grinding their own coffee beans. Simply press the large button that is located on the front of the machine and let the grinding begin. It most definitely helps you to grind the perfect amount of coffee that is needed for each use. This keeps the coffee beans as fresh as possible and avoids expensive waste. The ground coffee is caught in a borosilicate glass container that significantly reduces static cling. Another great feature of the Bodum Bistro is the unit’s friction clutch. It prevents costly damage to the grinder gear allowing you to use the machine on daily basis without the worry of breaking the mechanics. The silicon band located on the exterior of the device helps consumers grip the grinder firmly even when their hands are wet. Burr grinders are designed with a sharp moving wheel that slowly and continuously grind the coffee beans against a flat type surface. The Bodum Bistro crushes the beans between high quality and long lasting stainless steel conical burrs in order to conserve the aroma and flavor in a uniform grind. That is the exact reason why many consumers prefer a burr grinder instead of a blade coffee grinder. 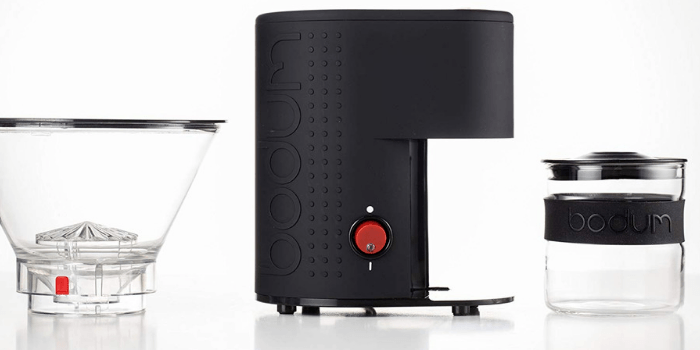 The Bodum Bistro is designed to never need sharpening. The stainless steel burrs actually stay sharp from the coffee grinding process. 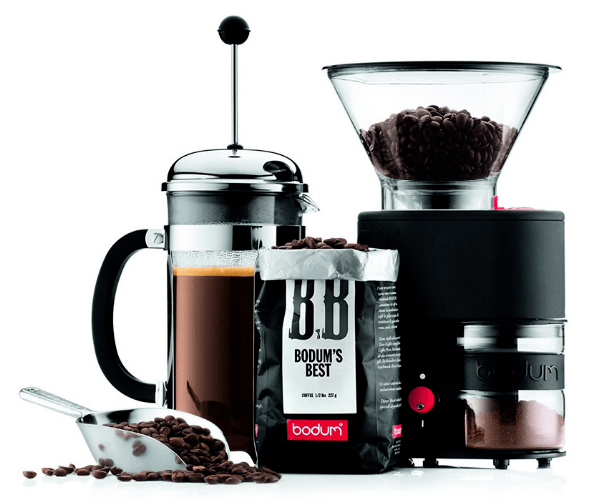 The Bodum Bistro Electric Burr Coffee Grinder is perfect for grinding beans when using a French Press brew ﻿p﻿ot﻿﻿. It must be noted that the French Press method is slightly more complicated than standard brewing. The following tips will help you with the process. In order to obtain the best results you should heat the water prior to grinding the coffee beans. Add your ground coffee in the French Press first, and once the water reaches a boiling point wait for thirty seconds before pouring it onto the coffee. The Bodum Bistro Electric Burr Coffee Grinder is as easy to clean and maintain, as it is to operate. The bean hopper removes easily and should be cleaned with a wet cloth only, along with the exterior of the machine. The top burr may also be removed in order to clean up the coffee grounds. Use a soft bristled brush to accomplish this simple task. Both the lid and coffee container is dishwasher safe making cleanup a cinch. In order to properly maintain the Bodum Bistro Electric Burr Coffee Grinder clean on a regular basis. The Bodum Bistro Burr Coffee Grinder is an extremely quiet machine. It will not wake up other members of the household if you happen to be making your coffee while your family or roommate is asleep. This machine is completely hassle free to operate. Simply set your preference and hit a button. The glass container literally contains all of the materials within helping to avoid the risk of clogging the machine. Easy cleanup and maintenance, which is always a plus. There are very little cons when it comes to the Bodum Bistro Burr Coffee Grinder. The only negative is that the coffee bean hopper is on the smaller side. It only holds approximately one half pound of beans while the competition holds upwards of a full pound. 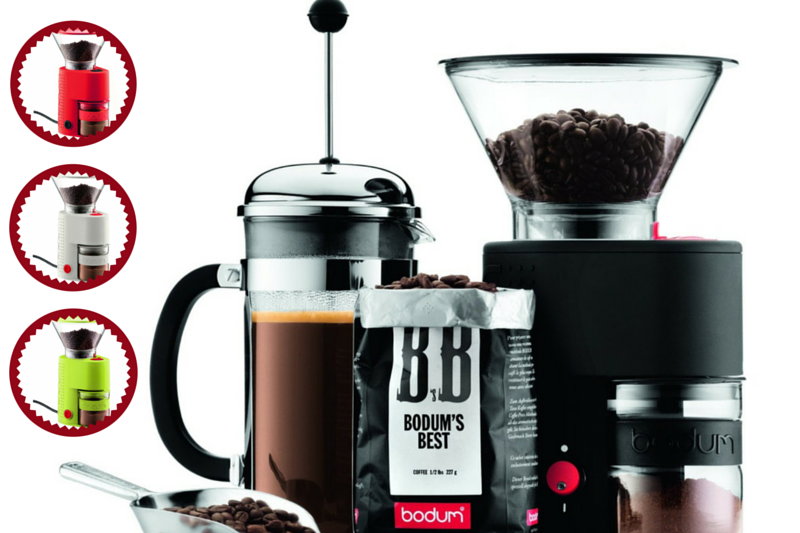 The Bodum Bistro Electric Burr Coffee Grinder is available to purchase on Amazon for $86.00. The Bodum Bistro Electric Coffee Grinder is certainly a well-made machine that is easy and fun to operate. It performs like a far more expensive grinder. The device is available in a wide range of colors including Black, White, Red, and Green. 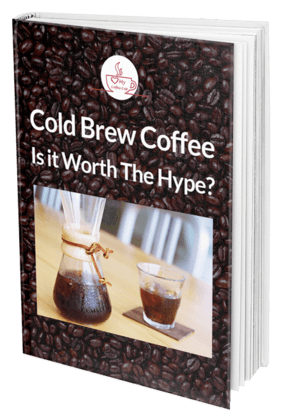 Overall it is an excellent choice that any coffee enthusiast will be happy with.